This is an awesome fossil shark tooth. It is a large (over four inches long!) 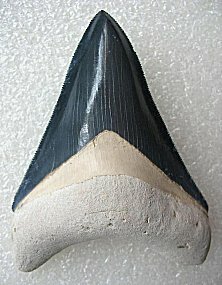 Carcharocles megalodon Extinct White Shark tooth from Bone Valley, Florida. This specimen was recently acquired from a major fossil shark tooth collection. High quality Megalodon teeth from Bone Valley are very scarce, since fossil collecting was stopped many years ago. The quality and color of this tooth is simply exquisite. The enamel is beautifully preserved - the color is as pretty as we have ever seen from this site. The serrations and tip are almost perfectly preserved and razor-sharp. The tooth also has a stunning ivory bourlette and a flawless snow-white root. Overall, this is one of the coolest 4"+ Bone Valley Meg teeth we have ever seen. It is a top quality, VERY collectible Bone Valley Meg tooth that displays like a dream.